Back to the Robots Home page. Click Here To Buy Pleo Now! NOTE: Pleo is now availalble for sale. Click Here To Buy Pleo Now! Please read the official Ugobe press release below for the full details on Pleo preorders. You will also find important details on Pleo World, the company�s official web site for Pleo owners and those thinking about becoming a Pleo parent. You can read our Pleo blog for more information. If you just can�t wait to be updated when more is known, subscribe to the blog using the friendly form on the right. Get the very latest Pleo tips, news, pictures, and videos, delivered direct to your email box. Subscribe now! EMERYVILLE, Calif. � June 21, 2007 � UGOBE, developer of revolutionary, robotic technology, today announced that online pre-orders for Pleo, the first in a line of designer Life Forms, have begun. Consumers will be able to pre-order Pleo through UGOBE.com (SOLD OUT as of 7-23-2007, use one of the following retail partners) as well as through online retail partners: Amazon, Best Buy, Target and Wal-Mart. UGOBE also unveiled a new community site today at www.pleoworld.com. The site will be a destination for not only buying a Pleo but also for information and interaction among the Pleo community. Pleo, a lifelike robotic dinosaur, will inspire mystery and awe as a companion. Like all UGOBE Life Forms, Pleo will evolve through life stages and develop a unique personality based on interaction with his owner. Pleo is designed for everyone from adults to �tweens,� both male and female, and mimics organic life through the use of leading edge robotic technology. Starting today, UGOBE will begin taking pre-orders for units to be shipped to the United States. Pleo will be $349 and pre-orders can be placed through https://store.ugobe.com/store or through UGOBE�s online retail partners. In October 2007, Pleo units will ship and the product will be available for in-store purchase in select locations. Availability outside of the United States varies by country. Check www.pleoworld.com for more information and regular updates. Once consumers have their own Pleo, www.pleoworld.com will allow them to create a custom profile, search for and communicate with other Pleo owners in their area, write a Pleo log (Plog) and upload photos and videos chronicling their time with Pleo. Membership at www.pleoworld.com, restricted to those 13 years and older, will also give Pleo owners access to critical software updates, product support, and new downloadable sounds and behaviors for Pleo. Pleo is modeled after a one-week old Camarasaurus (or long neck) dinosaur, the best-known Jurassic sauropod found in North America. Pleo progresses through three different Life Stages. In the initial birthing stage Pleo opens his eyes to the world and starts to acclimate to his environment. Through interaction with his owner, Pleo transitions into an infant stage and then becomes a juvenile dinosaur. The more time spent interacting with and nurturing Pleo the more unique he becomes. Pleo has a variety of emotions and expresses everything from excitement to fear. He learns as he explores his environment, gets tired and falls asleep and even gets hungry. Pleo will come with a training leaf to remind you to reinforce positive behavior by offering him a �treat� when he does something you like. Pleo uses a specially-designed, replaceable and rechargeable Nickel Metal Hydride (NiMH) battery pack. Each battery charge will last approximately one hour and it will take four hours to recharge Pleo�s battery. 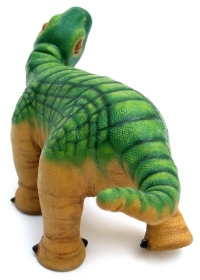 Each Pleo will come with a battery and additional battery packs will be available at https://store.ugobe.com/store. Each Pleo will have significant technology and processing power, including two 32-bit microprocessors, four 8-bit subprocessors, 14 motors, more than 100 custom-designed gears, 38 sensors, a camera-based vision system, two speakers, and multiple data ports (Mini USB, SD card slot, infrared transceiver). Pleo has gone through rigorous product development testing but like all things he is not unbreakable. Pleo requires attention and care and is not suitable or intended for children under the age of 8. Be sure to bookmark this page (Ctrl-D) and come back often! We look forward to seeing you again, right Pleo?